Flammability Rating: UL94V-2, Resistant To Fungus, corrosion, and most acids. Material: Nylon 66 Pure Virgin Material. Color: Black , White, Blue, etc. 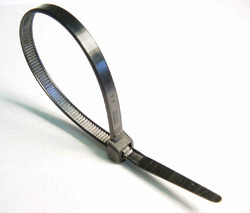 In order to fulfill the demands of our esteemed clients, we are engaged in providing an optimum quality array of Cable Ties.